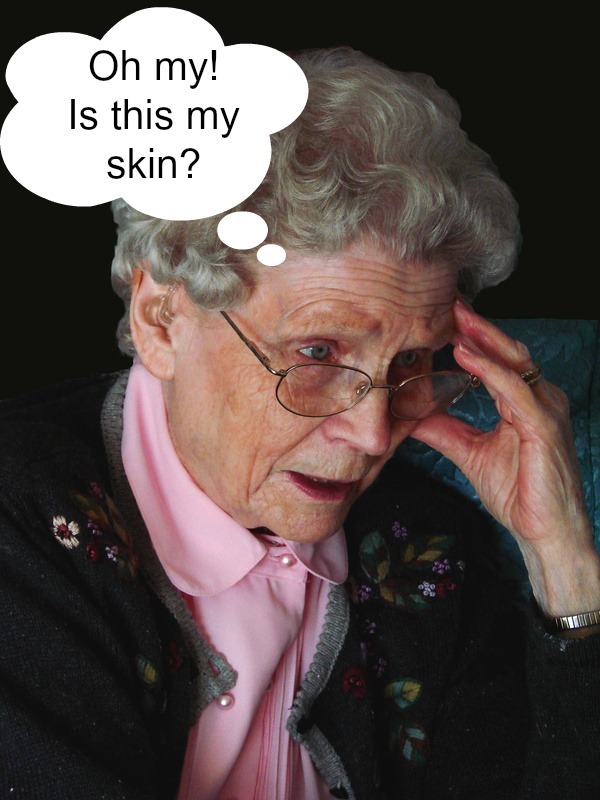 Posted byMei 17 September, 2014 1 September, 2014 2 Comments on Elderly Skin Conditions series – Elderly Skin, How does Skin Age? It is obvious that our skin ages as we age – even if we don’t look into the mirror or care to look at our own skin, the number of anti-ageing, whitening and anti-wrinkle products remind us that our skin grow old. Aging can be intrinsic (i.e. genetics) and extrinsic, with the main factor being sun exposure, although lifestyle (smoking, alcohol, obesity, diet, exercise) and pollution also play a role. We have covered skin functions in this blog, so below explains how our skin age and loses its ability to perform its functions. With the skin changes in elderly, there are numerous skin conditions that affect them. Most of the skin disorders have signs of skin inflammation and itch (pruritus). General itch without an underlying skin disorder is very common and mainly due to the breakdown of skin barrier, thus normally tolerated soaps and detergents start to trigger rash and itch (i.e. increasing risk of contact dermatitis). Atopic dermatitis is also common because of increased penetration of allergens via the defective skin barrier. As eczema, contact dermatitis and itch has been discussed in this blog (type into search box for all related posts), this series won’t cover these skin conditions despite being very common in elderly (as well as kids!). For this series, I’m covering 3 skin disorders which are common and that I see in elderly around me (aka Singapore). These are Statis Dermatitis (affecting varicose vein area), Incontinence Associated Dermatitis (from exposure to urine or stools) and Asteatotic eczema (cracked skin). Older people may also have health conditions where either the condition itself predisposes them to skin disorders (atherosclerosis, diabetes, HIV, congestive heart failure) or the medication might. For instance, non-enzymatic metabolites, diuretics and calcium blockers affect the skin. So take time to Google, research and ask the doctor for elderly in your family about potential side effects of the medication they are taking. Elderly who are immobile (i.e. always on the chair or bed) or live in homes are also at higher risk of skin disorders. Catch up next week on Statis Dermatitis and meanwhile, drop me a comment if you have a condition for elderly skin that you’d like me to look into! Great topic – atopic dermatitis is not so common in seniors, but it occurs, and is increasing unfortunately: sometimes for the first time! We find The Combined Approach: optimal topical treatment with habit reversal gives excellent results, as in all other age groups. Thanks Dr B, you built such a wealth of resource on your site! Do join #dadchat this Thu evening 9-10pm PT, it’s my Fri 9-10am GMT+8 – not sure what time zone it is for you! But do drop by cos we’re talking parenting eczema and allergy kids!